New rules being introduced relating to the use of CCTV video recordings submissable as evidence state that it must be proven that a video tape has been completely erased before being reused if it is to be submitted as evidence. 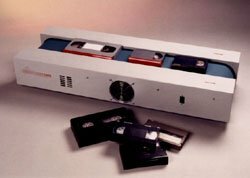 As it is not possible to predict when a video recording is going to be needed as evidence, it is essential that all video cassettes are completely erased prior to reuse. It is essential that CCTV video recordings are of the best quality if they are to be used for recognition or evidence purposes. Reusing video cassettes without bulk erasing will result in poor quality reproduction on playback. Bulk erasing will also ensure conformity with the latest Data Protection laws being introduced throughout Europe. 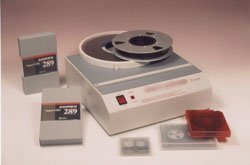 These Degaussers provide the most convenient method of bulk erasing video cassettes for operators of VHS or S-VHS CCTV installations. V880: High throughput of VHS or S-VHS cassettes per hour.